We know that house clearance N11 can be an overwhelming prospect. You have spent a lifetime in your home collecting goods, toys, clothes, furniture, and odds and ends that made your house a home, but now you have no use for. This is not an abnormal scenario – this is the way that life works. We outgrow the things with which we fill our homes. Our tastes changes, we decide that we do not want particular mementos any longer, or we realise that we are tired of dusting our knick-knacks. Whatever the given scenario, our homes need to grow and change with us as we ourselves grow and change. This can often lead to clutter that needs to be removed to make room for change. 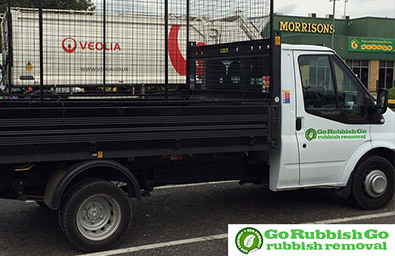 We at Go Rubbish Go can help you clear out your home without breaking the bank. Hire us for Brunswick Park, N11 house clearance and you will save time and money! Book now on 020 8610 9182! On top of offering high quality services, we also strive to keep our house clearance prices in N11 reasonable and affordable. We know that living in Brunswick Park can be expensive enough – making sure that your house is only filled with things that you love should not be an added expense. This is why we only charge you for the goods that we remove from your house. That’s right – you only pay for the waste that we take away. There are no surprise charges or additional fees. The pricing is as unique as the items we are hauling away. That means you can keep your Brunswick Park house clearance N11 affordable. 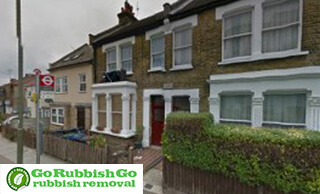 Turning to a company that has a strong reputation for customer service is a very smart move when making the decision to undergo a house clearance in Brunswick Park, N11. We are an organisation that prides ourselves on customer service and make sure that you are at the forefront of all we do. We want to give you the clutter-free home that will make your life feel hopeful and clean, and we take our guidance from you in the N11 house clearance process. We take what you want gone, and leave the rest, and there is no judgement about the amount we clear. This is your home, we just want to help you get it back to an ideal state. If you are thinking that our N11 house clearance Brunswick Park is sounding pretty good, but you are a busy Brunswick Park resident with not a lot of time to spend waiting around for someone to show up and haul away your goods, we are the perfect house clearance company for you. We provide honest timelines with when we will arrive at your house, and if you call us this morning we could have your house all cleared out by this afternoon! 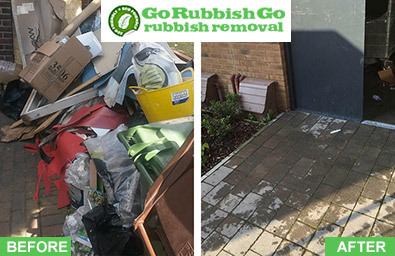 At Go Rubbish Go we know that no one has a lot of time to spend on hauling out rubbish, which is why we work fast to get the job done and let you get on your way! The people of N11 have spoken, and they have said that we are the top choice when it comes to house clearance Brunswick Park companies. We work hard to put our customers’ first, keep our work speedy, and keep our prices reasonable. We have a reputation for offering eco-friendly services and recycling more than 85% of the items we take from your property. This is why customers come back again and again. Call us on 020 8610 9182 and see how we can help you! Get a free quote and find out how much it costs to hire a professional house clearance team! We know how important it is for you to be treated with the respect and professionalism you are searching for. For this reason, we have only hired customer support representatives who really know what they do and who are genuinely friendly and willing to help. No matter what kind of house clearance N11 job you want us to perform and no matter how large or small it may be, our customer support team will provide you with the best and most accurate tips of information on Brunswick Park house clearance – and they will do it in an honest, straightforward and more than polite way too. Call us now on 020 8610 9182 and see for yourself! Brunswick Park is part of the London Borough of Barnet and borders New Southgate to the south and Oakleigh Park to the north. This is a typical London suburb with ample amenities, a small-scale industrial district and a recreation ground that includes tennis courts and a sports field. North London Business Park and New Southgate Cemetery are two of the more noteworthy places here and with their main entrances found on Brunswick Park Road. Part of the former cemetery grounds is now occupied by a housing estate. The nearest railway stations are Oakleigh Park and New Southgate, and the nearest tube station is found in Arnos Grove.